I found a little poem book at the thrift store that I have slowly been recycling the pages from. This poem is called "The Poppies in the Garden" by Frida Wolfe. I grabbed my Poppy SEI paper stack and embellishments to decorate the front, and added a simple "Hello" to the chipboard to complete this all occation greeting. The card stock is by Papertrey Ink colors: sweet blush and lemon tart. The striped paper is from DCWV Nana's Nursery "Baby Boy" collection. The blue paper is from SEI's "Poppy" paper stack. The Rabbit is Hero Arts "Victorian bunny". And the "Easter Wishes" sentiment and paper punch is by Stampin Up. The blue and the green from DCWV matched perfectly with the blue from SEI's collection. I added a folded flower with some bling and some lace and ribbon flowers to finish off this Easter greeting. Fun! Have Fun ~ Isn't this fun? ~ Are we having fun yet? ~ That is so fun! and on it goes ~ I say it all the time. I used an inexpensive foam stamp that I love and stamped my "Fun" sentiment. I added rhinestones for bling and a clip on charm that I recycled from who knows what to create this colorful "Happy Birthday" greeting. Get Sketchy's challange made me think of these great Grannie crochet flowers I have in my stash. I then remembered this diecut that reads "Grandma". From there I pulled out more vintage themed items and created a collage card. I think this would make a loving note card from Grandma, or it could be used as a sympathy card as well. 365 cards ABC challange yesterday was the letters S for stiching, T for Toile and W for White. I'm not one for sewing, so this was out of my league a bit. I like the fact that this all occation card is simple in design and yet carries enough detail for impact. Yesterday's Alphabet Challenge was to use the letters M for Markers, N for numbers and O for the color Orange. I had fun using my grungeboard numbers and word wundow by Tim Holtz. I used ink to turn the grungeboard brown, and used marker to ink the "Happy Birthday" stamp in keeping with the challenge. I added more embellishments like ribbon, brads, flowers, and making memories "celebrate" charm to complete this bright and happy card. Today's Alphabet challenge was P for polka dots, Q for quilt, and R for Red. I think this turned out to be one of my favorite cards thanks to 365 cards! I've wanted to make more paper fold projects, and I thought this pattern looked like a quilt. I added a piece of real tape measure to the side of the card, and added a wonderful sentiment by Stampin Up that reads "Friends like quilts give comfort when needed" . The little heart button and a few ribbons added just the right amount of embellishments to this encoouragement card. I was working on this for 365 Cards ABC challenge, and we are up to the letters G, H, & I. 365 cards ABC's of crafting challenge, we are on the letters D, E & F. D as in Distressed, E as in Envelope, and F as in Fringe. For "D", I distressed the paint on a large round grommet made by Making Memories and also tore the paper edge for effect. For "E", I made a mini envelope to stick money or other small treasures inside. Lastly, for "F" I used this terrific hot pink pom pom fringe that I found in my ribbon stash. I added rhinestones for bling, a Happy Birthday sentiment, and now this card is ready for some lucky young girl. Today's Challenge on 365 Cards: ABC's = A as in Alphabet Stickers/Stamps, B as in the color Blue, and C as in Circle. I couldn't get a good picture of my card today, but this was the best out of the bunch! I dug in my blue scrap drawer and punched a bunch of circles. I kept playing and adding untill I arrived at this arrangement. I was greatful for the sketch challenge from Crop stop to help me with the design for this card. Also, the challenge on Basic Grey: http://basicgreychallenges.blogspot.com/2011/03/challenge-40-something-recycled.htmlo to use something recycled as well as Basic Grey products. The background paper I used is from the "Perhaps" collection called "Julia" ( per739). I recycled a button card that I found at the thrift store into my card design. According to my friend Tammy, sewing notions are all the rage now and currently appearing on lot's of card fronts. The sentiment matches the vintage feel of the birthday greeting. Today's challenge on 365 cards was to think of "A Crush". I found in my paper stash this paper that reads "This Magic Moment" and went from there to embellish this sweet card. Once again 365 cards has challenged me to make something I've never made before! I made three very sweet little notes all in two shades of blue with different lace and embellishments for variation. I made 3 envelopes to match by taking a 5 x 5 piece of paper and scoring at 3 3/8ths all around. (which is 1 space or 1/8 more then 1/4) I use a small square punch to get my little triangle notches to look so good! 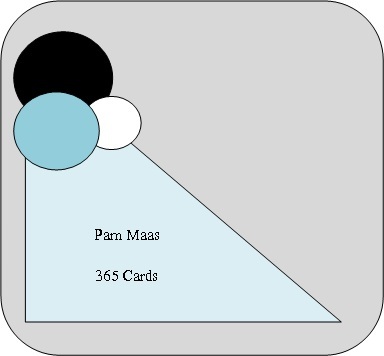 fold and glue and you have envelopes for your 3 x 3 cards. Today on 365 cards we were to be inspired by this ad. When I saw all that green, $Money$ popped into my mind! 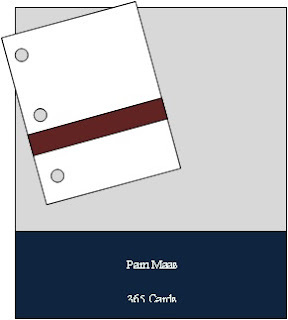 I remembered on this site://www.ruthannzaroff.com/mirkwooddesigns/templates.htm there is a money holder template. I printed the "New US money version" on green paper and cut it out. I still had to fold the money to make it fit right, but I really like the outcome. I added a small magnet to the bottom lip to make it stay closed, but you could use a money clip as the gift and keep the card closed with that as well. This card was made by squirting re-inker inks on blender paper then folding the paper in half and seeing what you end up with. I loved the colors and starting making an underwater scene, and soon found out you really need to wait for the paper to dry before you rubber stamp on it! I starting cutting up the pieces and playing around and the result is a very modern thank you card. I made this card for my husbands birthday. I love the colors and the patterns on this card. I kept it masculine by not adding a bow and instead adding some brass embellishments. 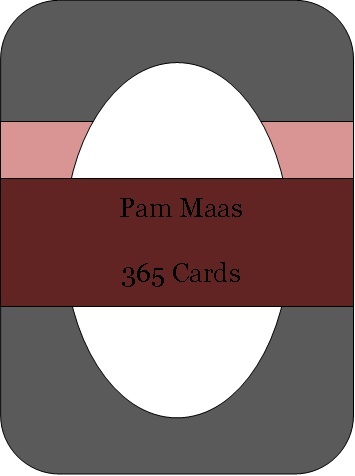 Today's challenge is to use the colors black, olive, and cream on a card. I instantly thought of graduation! I dug into my paper supply and found DCWV's High School Stack. The background paper with the border was a thrift store find. It's original purpose was a one page printable invitation with envelopes. Whoever purchased them must have abandoned the project, so it happily ended up in my stash! I cut the background down an 1/8, and mounted it on a cream colored card that will then fit into the envelope it was intended for. I added ribbon, a tag, a sentiment, and some bling!. This card took me longer then I expected this morning. I kept adding and adding till I couldn't fit another thing! I used clear stamps by Hanna and Hero Arts "Seize the cupcake" set to create this "Happy Birthday" card. I paper pieced her apron so that it would match the background paper. This request is to make a birthday card, and the added challenge is to make it for a THREE year old. My #3 is made out of grungeboard by Tim Holtz that I inked and embossed with clear powder. I added ribbon, rhinestones and a cupcake for embellishment. 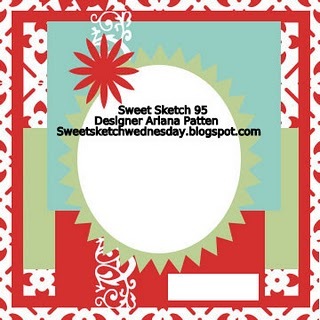 Here is the sketch challenge from 365 cards for Sunday, Day #13. I used Stampin Up paper along with buttons, flowers, a rhinestone, rick-rack, and ribbon. Today's challenge from 365 cards is called "Keep it Simple" you were to cover the front of the card with patterned paper, add a sentiment and one embellishment, and that's it. I dug in my brown scrap drawer and used my Stampin Up punch called "Modern Label" which I love, and punched a bunch of labels. My embellishment is ribbon and I chose "Just a note" for my sentiment to keep it simple. The title of this challenge is right up my alley since I am Creativeseconds! Did you ever buy paper just because it was 75% off?! that's what I did with this Halloween themed paper pack by "Me and my big ideas". Today's challenge on: http://365cards.blogspot.com/ is to find some paper in your stash that was intended for one holiday/season and give it a new life. I think this spider card would make a great birthday or thinking of you card for a little boy. I'm sooooo ready for Spring! I love using flowers and rhinestones for bling! The rick rack is fun, and helped to balance the other side of the card. I finally used my new embossing folder from stampin up too. This will be a nice "Thinking of you" card to send to a friend next week. Today's Challenge on http://365cards.blogspot.com/ is to add something to your card that is trendy. I used bakers twine to thread through the botton which is really popular right now. 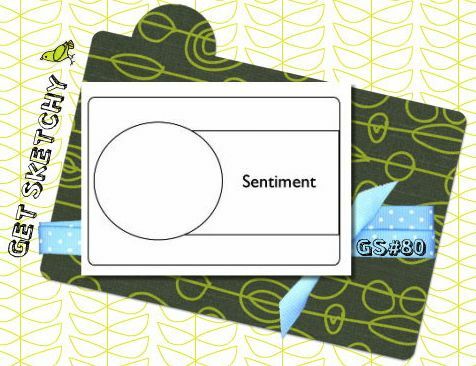 The thread is inexpensive and adds instant character to your cards. Buttons and ribbon are my all time favorites, and I added an element that I've only seen a few times around that I think should be a new trend: "Bobby Pins". Everyone is wearing them in their hair...why not on a card! The card recipient can take it off and keep it as a gift and wear it in rememberance of you! I found this bobby pin at a store called Forever 21 in the mall On clearance a pack of 7 pins was only $2.99 which is cheap as far embellishments go. 365 cards "Doing the Decade" 90's = Pokemon! My older daughter and her cousins loved Pokemon, and traded and fought battles together in the 90's. Now my youngest loves Pokemon and drew some of her favorite characters on paper. She was just awarded "super star" for reading, and I thought this card made out of her own pictures would be fun to congratulate her with. Today's Challenge was to make a card with an arch. When I think of arches my mind envisions secret gardens with gates and fairies. This card was stamped and colored with watercolor pencils and markers in a collage theme. This is my first Blog post & my first 365 day card challenge! Today's challenge called "Feeling Fierce" made me think of metal which is hard and cold. I gave it a love theme for contrast and added the silver heart and the words "soul mate" as well as "woman" & "chick". The metal hinge added character to the theme as well.